utilisé en live via l'apollo twin, ce plug est vraiment bien foutu! j'ai quelques pédales en amont (drive, boost, fuzz, wha, etc ...) et je rentre dans le plugin vers un son clair,légèrement crunchy. ce que j'adore c'est l'amplitude du son avec le potard de volume de ma telecaster, vraiment bluffant! je note quand même que les preset sont très sourds, bizarre... et que le plug a tendance à saturer, donc bien faire gaffe au gain d'entrée. l'utilisation en mix est très interessante également, les simuls de micros avec les options de panoramiques sont bien faites, bref, un gros son comme j'aime. I love this amp so much I own 2 of them; one for the studio and one for live gigs. I could pick out the sound of these amps in my sleep. This emulation is pretty damn close, though the real amp is a bit richer in those awesome pre-clipping harmonics its known for (nothing beats real tubes IMO). While I've never been a fan of amp sims, this one surprised me. While I'll stick with the real thing, those who want the Bluesbreaker sound in a sim, you'll like this. For all guitar work, except Glamrock. The plug is truly dynamic and works towards the guitar as the real thing. To clear my review title, I use the Jubilee Amp for my Glamrock playing but for all else more contemporary stuff this 1962 does it completely amazingly! One little thing I would have loved if the room mic could been routed to a separate input in my DAW, but I can live without it as the plugin is so great. Great Sound - Missing bypass pre amp feature! A great sounding simulation BUT - where is the bypass pre amp feature from the ENGL amps? You get the real deal. This is, hands down, the best amp sim I have used...pretty shocking, really. I'm usually not a big fan of amp sims, and strongly prefer playing cranked tube amps. That being said, I personally feel like the UA Marshall sims are the best out of all the available UA amps...the Silver Jubilee, Plexi and Bluesbreaker being my favorites. I was demo-ing a number of the UA amp plug-ins, and while a lot of them sound pretty decent, this Bluesbreaker stands above the rest. The combination of the the very detailed emulation of the kt-66-ish fat warmth and the various mic/cab configurations that give very realistic room-sounds just make this sim a pure joy to play. I was lost in playing the many excellent-sounding presets for hours...very, very similar to the real-deal. While all the presets sound like a bluesbreaker/jtm amp, there are many different tones to be had, from warm cleans to various dirty and overdriven sounds. The thing that really makes this one stand above the rest though is that it behaves similar to an actual tube amp...responds well to subtle differences in picking, volume/tone knob adjustments, etc. This sim with a plate-reverb plug-in is just killer. The only downsides are the high price, and that there can be some very slight, strange harmonics generated here and there...probably not noticeable in a mix though. So, if it's not possible for you to crank up an actual bluesbreaker amp for home-playing/recording, this is a very close alternative to check out. Now I’ve had my new Marshall Bluesbreaker plug for almost one month. Firstly I must confess I also own the ”real” deal i.e. a 1962 Marshall Bluesbreaker that’s been with me for over 15 years. I love the sound from it, so in order to make things easier and more comfortable - I just had to get this plug in from UAD. I must say I am stunned over how great this plug sounds, and how easy handled it is. Now I have completed my virtual amp setup by four fantastic plug ins from UAD. Last but not least, a fantastic Bluesbreaker. Love this Amp. Sounds amazing with a Single Coil or Humbucker equipped Guitars! Very realistic emulation, sounds are very decent and usable in your mix, plenty of usable presets, very versatile and easy to use. it reacts nicely to your guitar if you pick softer and harder !! By best plugin amp to date, it is really plug and play. I even use this to practice instead of my Carr Rambler, with I love. If you should have only one amp in your computer, this should be the one ! Sounds amazing, but there are definitely overtones that sound either a minor 6th or a 5th below the fundamental note. The other softube Amps do not have this problem. I hope it gets corrected since this is an excellent plugin for jazz and other deep tones. Sonido gordo y calido, gran posibilidad de microfoneo, se siente la "valvula" dando vueltas! Una buena imitacion para tener esa lead guitar de caracter. Another gem in the UAD/Softube collection. 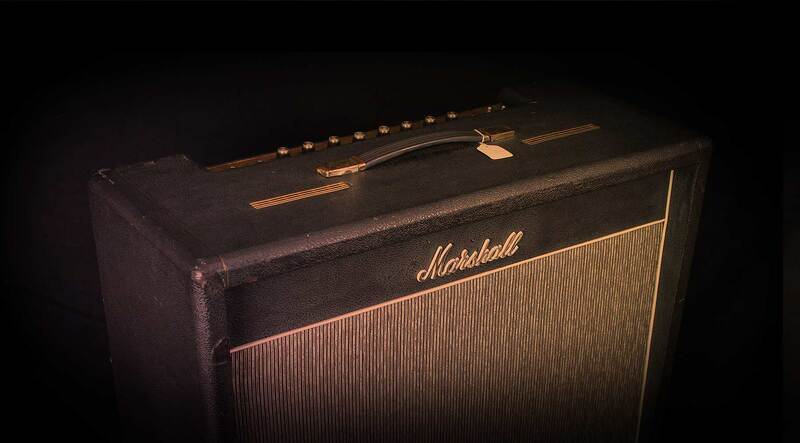 Warmer and darker than any another Marshall, but super-dynamic and with tons of character. You can really get some beautiful Beano-like clean/crunch sounds controlling the saturation with your pick. It is probably the most “specific” plug-in of the Marshall Legend bundle, but it certainly delivers that Holy-Grail-Tone! just so you know, Im not a guitarist but I recognise a good sounding virtual amp when I hear one. I've gone back to some tracks, which some live guitar was played on, and the transformation the Bluesbreaker delivered, was incredible. It brought body, and a richness I would have found hard to get any other way. Also It's great with a Rhodes through it.